I didn’t plan for the one-two punch of you should really read some Virginia Woolf that came with reading Rebecca Solnit’s collection of essays followed by Sina Queyras’ poetry collection but I have the two literary black eyes to show for it and I don’t mind. I don’t have any excuses. None come to mind except that I just haven’t bothered to yet. I will probably rectify the situation in the near future. I’m not quite sure how I managed to avoid Woolf so completely throughout my undergraduate degree in English literature. 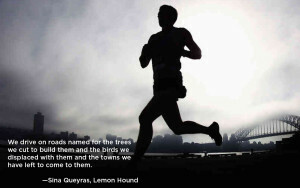 I also didn’t know that Lemon Hound was a book of poems before(?) it was the formidable force in Canadian/feminist poetics that is the (sadly, defunct) blog lemonhound.com though the blog started in 2005 and the book was published in 2006. Defunct isn’t the right word, either, since the site is still alive, though with no new material since May 2015. I recall reading Queyras’ to social media announcing that she was moving on to other endeavors and the wave of ugh that swept through the community. It left a hole that has yet to be filled that I’m aware of at least. Maybe I’m out of touch. It happens. I’ve been trying to keep my running interesting by mixing up my routes but it’s not really working all that well since I really only have two routes and they’re approximately the same distance but with dramatically different scenery and my decision to turn left or right is usually decided by the position of the sun in the sky when I leave my building. With Daylight Savings on the near horizon about to push the sun away from its horizon that could change, but for now it’s left for the lit path if the sun sets before I finish, and right if it’s a morning or midday run. They look like this. This one takes me over the Burrard Bridge the then down (up?) Cypress Street connecting to the Seawall path at the Maritime Museum then around Science World and back to English Bay. 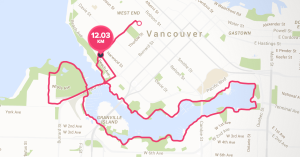 It’s a nice, flat run with the exception of the climb to the middle of the bridge, and it’s lit from the bridge all the way back to English Bay (except for that part through Vanier Park). I have a headlamp for the short dark section from the north side of the Burrard Bridge to Bute Street that has garnered me a couple “TOO BRIGHT!” comments. I highbeam people. I’m a jerk. This is my lit-by-the-sun option. Although I have said headlamp, I prefer to use it sparingly. Not glaringly? [groan…] This route is straight down Barclay and then under West Georgia and onto the Stanley Park Seawall. 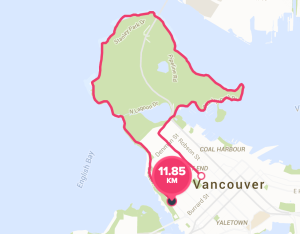 I like this run, and it’s probably my favourite especially in inclement weather when the Seawall is mostly deserted. The one part that I still find slightly deflating is when rounding Brockton Point under the lighthouse and seeing the Lions Gate Bridge way off in the distance. It looks a lot farther than it is.